Snow, snow and more snow, here in RBNY Land. The only good thing about all this white stuff is that Mr. Backe & Mr. Soler must feel right at home. But never mind the snow, let's get to some news. 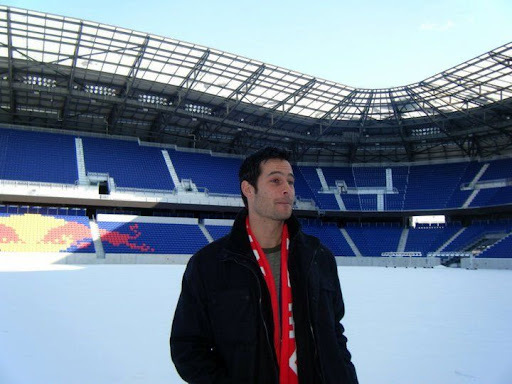 This past weekend, the great Mike Petke (pictured above), now a member of the RBNY Front Office, hosted a tour of The Cathedral of Football for members of the Viking Army Supporters Club. At this event, which was dubbed Petkepalooza, the legendary former MetroBulls defender showed why he was/is a fan favorite. Mike shared his experiences as a player, led the tour & took the time to answer everyone's questions. He even had a few words for us here at The Viper's Nest. Thanks Mike! The Red Bulls have officially signed DJ Jan Gunnar Solli. The Norwegian, who can play mutiple positions, vows to work hard and will also look to, possibly, get some DJ gigs on his days off. The Red Bulls have also officially signed University of Maryland midfielder, and Red Bulls Academy product, Matt Kassel. RBNY Sporting Director Erik Soler believes Kassel is a good all-around midfielder that needs to develop his defensive skill. Kassel will be part of the youth movement at RBNY, that will include Giorgi Chirgadze and might include Sacir Hot. Speaking of Chirgadze, Mr. Backe had great things to say about the first ever Red Bulls Academy Homegrown Player signing. Signed in 2009, Chirgadze missed the whole of last season with an injury. Red Bulls Sporting Director Erik Soler recently spoke about how he's looking to add a Right Back, a Central Defender and, possibly a Center Midfielder before the season begins. The Right Back he wants to add looks to be Honduran International Mauricio Sabillon. Honduran newspaper Diez reports that Sabillon is close to reaching an agreement with the Red Bulls. Former Rapids defender Steven Keel became the first trialist reported at Red Bulls 2011 pre-season camp. Mike Petke, a teammate of Keel at the Rapids, recommended him to the RBNY coaching staff. Finally, a couple of good articles this week, from UK publications, on current Red Bulls players. One is on the recently re-signed Carl Robinson and the other is on the recently drafted John Rooney. Both are definitely worth the read.